The consistent excellence of musical performances from Class Act Productions are well known here in Montgomery County and The Woodlands, Texas. 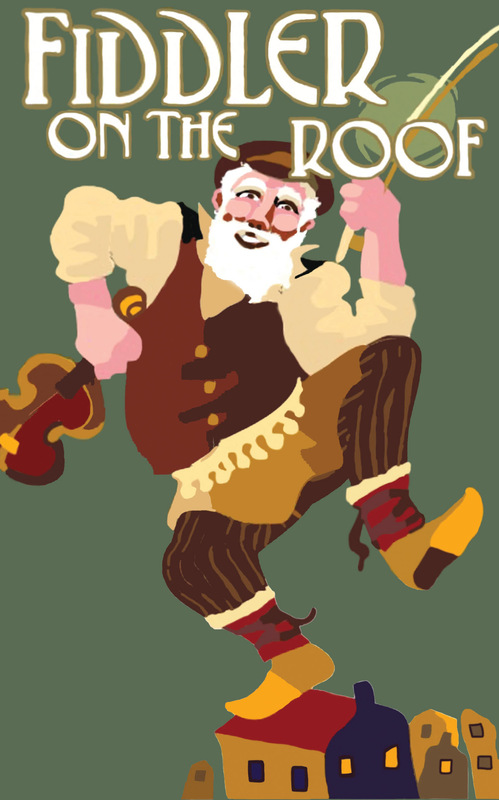 Over at the Nancy Bock Center for the Performing Arts that excellence was again on display as the group’s recent production of FIDDLER ON THE ROOF welcomed the first day of November; but that display was not without its unexpected problems. The events that followed would once again show that these talented youngsters know only too well that, “The show must go on!” Happily, it did, and it was very wonderful by almost any measure. With a Book by Joseph Stein (based on the Sholem Aleichem stories), this Tony Award-winning Broadway musical had the wise and witty lyrics of Sheldon Harnick, the lush and memorable musical score of Jerry Bock, and the charming dance designs of legendary choreographer, Jerome Robbins. No wonder it became an instant classic after opening in New York in 1964. 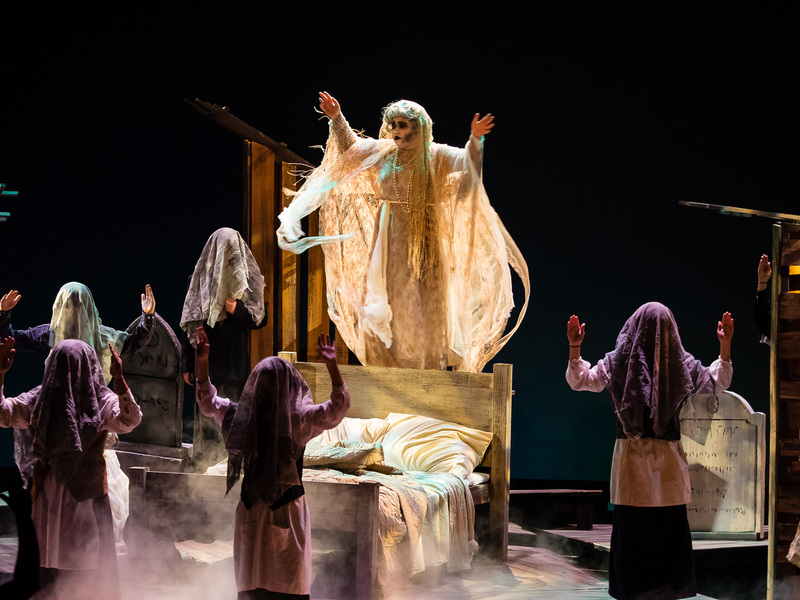 In this current edition, beautifully directed by Class Act founder/producer, Keith Brumfield, we had elegant choreography from designer, Tony Smith, and the fine Musical Direction of Rae Moses conducting the Fiddler on the Roof Orchestra. With an appropriately clean and simple set (designer, Jonathan Shelledy), the story takes place in the poor Russian village of Anatevka and revolves largely around an endearing peasant named Tevye (William Hahn). Mother Golde (Murphy Baker at left) and the daughters portrayed by Gabi Martinez, Abby Tozer and Payton Russell. Tevye is a hard working milkman struggling to support his five daughters and his determined wife Golde (Murphy Baker) who is intent on good marriages for their eligible daughters. Golde enlists the aid of the local Matchmaker, Yente, and Cecilia Herrington brings comic flair and great fun to her amusing portrayal of that character. 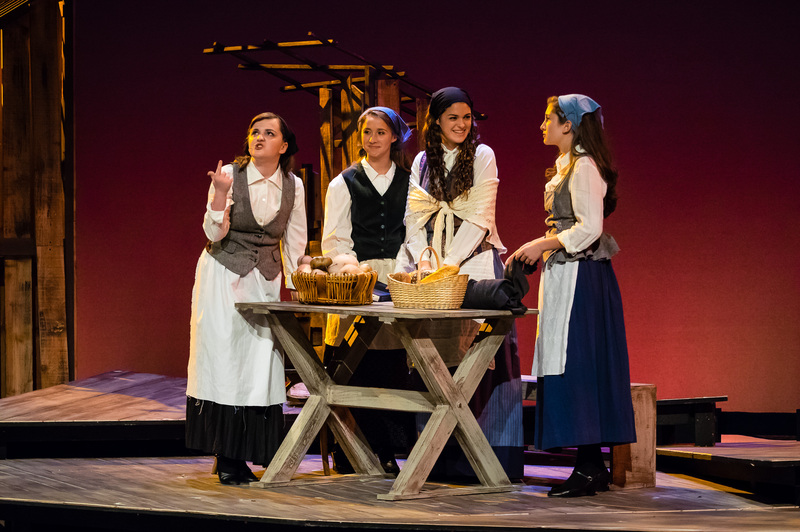 This tale’s enduring appeal derives from its powerful depiction of the universal conflicts and changes between older and younger generations, as seen here between Tevye, his wife and their three eldest daughters, Tzeitel (Gabi Martinez), Hodel (Abby Tozer), and Chava (Payton Russell). The girls each have romantic notions of love and marriage that come into conflict with the strong cultural traditions of this Jewish community. The theme easily becomes a parable for our own, or for any age, as is made profoundly clear in the exquisite opening number, “Tradition.” It is beautifully performed here by Tevye, Golde and the full cast skillfully delivering the haunting counterpoints of this beautiful score. 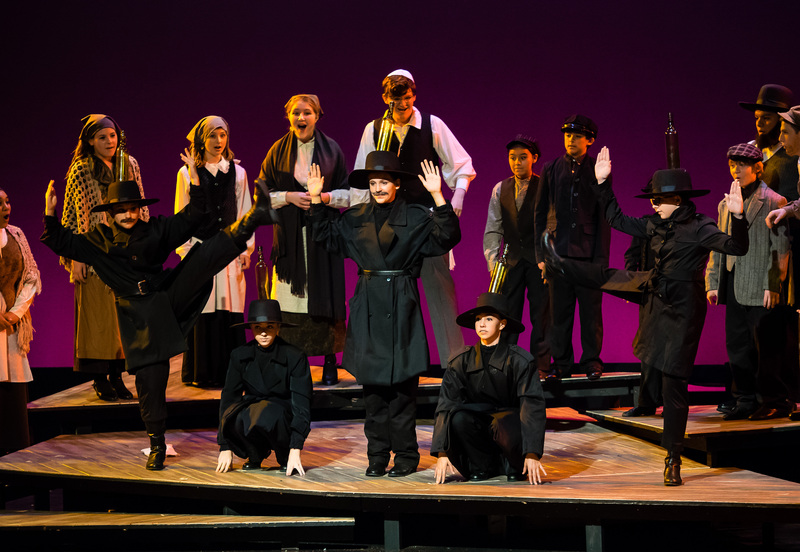 There were charming and authentic peasant costumes (designer, Caroline Zirilli), delicate and whirling choreography (designer, Tony Smith), and right from the start, Mr. Hahn’s rich and powerful baritone voice was a highlight of the production. It would also be its salvation before the performance was over. The show glistens with memorable melodies. The daughters light up the stage with the playful joy of “Matchmaker,” and with his rich voice an commanding stage presence, Hahn beautifully captures Tevye’s longing for a better life during the classic, “If I Were a Rich Man.” Some scenes are even aptly punctuated with short musical motifs during brief and shadowy appearances of a real Fiddler (musically talented, Amelie Hidajat). The spiritual warmth of the “Sabbath Prayer,” so wonderfully performed here by the cast, is probably as close to a religious experience as we could hope to have without visiting a house of worship. Lazar feels betrayed and Golde is so furious the marriage to a prosperous butcher has been foregone that Tevye then fakes the ghostly nightmare of “The Dream,” a riotous scene in which the ghost of Grandma Tzeitel (a riotous performance from Katie Stobbe) returns from the grave to convince Golde a marriage to Lazar would mean disaster. Speaking of disaster, Mr. Hahn would skillfully navigate a potential one during the Sunday matinee I attended when his body microphone failed for a significant part of Act One and ultimately had to be replaced. It was an awkward challenge, but both he and the fine cast carried on without a moment’s hesitation. Now that’s a CLASS ACT. Of course the continuing joys of the show included the dazzling “Wedding Dance,” (featuring the amazing Bottle Dancers), along with memorable songs like “Sunrise, Sunset,” the touching, “Far From the Home I Love,” and the poignant duet of Tevye and Golde for, “Do You Love Me.” All of these served to bring the show beautifully back on track. 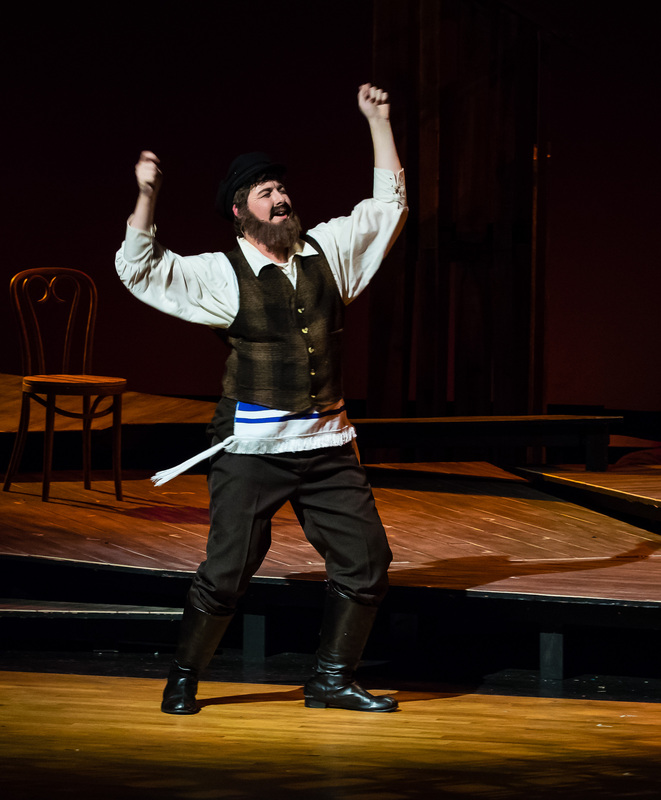 Of course Tevye has more hurdles to overcome as his daughter Hodel falls in love with a young revolutionary teacher named Perchik (Hayden Cox), while his daughter, Chava, gives her heart to a non-Jewish young Russian named Fyedka (Garrett Newlun). To compound matters, Russian troops ultimately force the Jews to leave this little village, but as Tevye and his family begin the long journey to freedom in America, there is a final note of hope and optimism in the poignant song, “Anatevka.” It reminds us all what it truly means to find liberty in our great nation. This entry was posted in Broadway, BroadwayStars.com, Class Act Productions, Conroe Courier, Fiddler on the Roof, Houston Community Newspapers online, Nancy Bock Center for the Performing Arts, The Courier Columns, ThePeoplesCritic.com and tagged Broadway, Class Act Productions. Bookmark the permalink. Thanks for article. -See you in the early Spring–I guess. Have a safe trip. Hope you will send the review of the Conroe Sinatra show.